Photograph of Harry Godson holding photograph of paddle steamer 'Ariel', the first original photograph he collected (in Godson Collection at PRG 1258/1/137) / photograph by Advertiser Newspapers Ltd : 20.3 cm x 15.3 cm. 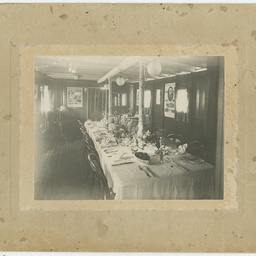 The dining room prepared for a meal on board P.S. 'Gem' 1910 (another version at PRG 1258/1/1235). Handwriting on back of item 3, relating to the photograph on the front? 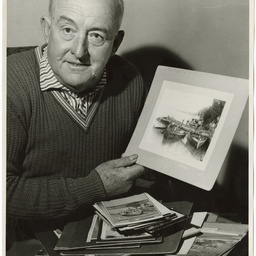 Photographs, reproduction of artwork and advertising posters relating to Harry Godson's interest in River Murray paddle steamers. See 'Contents' in "More info' for details of three digitised images. For four others, see 'Archival items'. PRG 1258/48/1: Photograph of Harry Godson holding photograph of paddle steamer 'Ariel', the first original photograph he collected (in Godson Collection at PRG 1258/1/137) / photograph by Advertiser Newspapers Ltd : 20.3 cm x 15.3 cm. PRG 1258/48/3: The dining room prepared for a meal on board P.S. 'Gem' 1910 (another version at PRG 1258/1/1235). 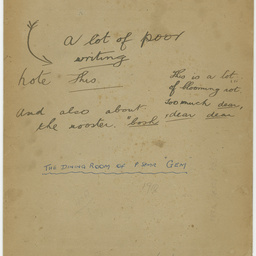 PRG 1258/48/3V: Handwriting on back of item 3, relating to the photograph on the front?